Synonyms: agreeable, calm, composed, cordial, even, friendly, gregarious, level-headed, lovely, nice, pleasant, poised, sociable, steady, stable (like the tight-rope walker who must make constant adjustments to find balance), warm. The companion Spiritual Libra exercise by Christopher Gibson is accessed by clicking here. C. C. Zain tells us that the language of symbolism is the purest way for the unconscious mind to receive information and the easiest way for the astral brain to transmit information to everyday consciousness. Because of this the ancients chose the language of symbolism to communicate important spiritual lessons. 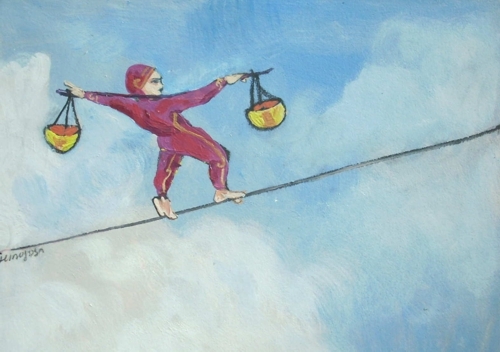 Libra’s keyword is “I Balance.” The Suns entry into Libra coincides with the Autumnal Equinox, the second time of the solar year that day and night is equally balanced. The first equinox occurs when the Sun enters Aries and the days are growing longer. The Autumnal equinox occurs when the Sun begins to decline in vigor and the days are growing shorter. The beautiful, vibrant colors of spring and summer have faded. Crops planted during spring have been harvested. In the natural solar cycle it’s time to assess whether there is enough food and adequate shelter to last through the long cold of winter. This time of reckoning in the natural world coincides with one of the world’s “holiest” times of year—a period when sacred traditions around the world set aside a time for devotees to review their thoughts, deeds and actions of the previous year. Weighing good deeds against those that are not, believers are encouraged to assess how they measure up to the moral code to which they aspire. It is a time to establish moral equilibrium by balancing spiritual aspirations with actual progress in daily life. 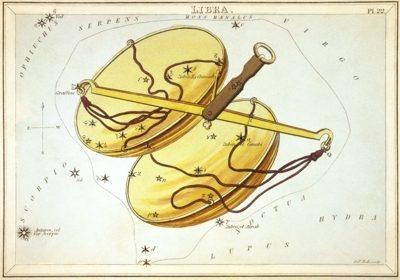 Fittingly, the symbol the ancients chose to symbolize the energy of Libra is the Scales. The two pans, representing two forces or bodies, balanced one against the other, hang from a beam that engages and unites them both into a whole system or unit. Like the Scales, it is not unusual to observe Librans teetering between opposite positions or points of view, carefully weighing the matter at hand. Their process draws them to the work of gathering adequate information such that fair and balanced decisions may be rendered. Librans are also lovers of companionship. They seem to innately recognize that something is missing when they are alone for too long. The reunion of soul mates, to which marriage is a precursor, is not lightly called “The Great Work.” Achieving harmony and equilibrium between two people struggling to discover and fulfill who they are as individuals, while trying to work as a single unit, is challenging. The ancient masons refer to individuals as “diamonds in the rough.” Interestingly diamonds are the gemstone of Libra. Perhaps the constant friction of one ego rubbing against the other provides the polishing agent that reveals the brilliant gem that each of us is destined to become. The friction and work of marriage and partnership is an opportunity to compromise and reconcile differences that bring the Scales into a state of symmetry, grace and poise, symbolizing a mature love that has been tempered by experience, patience and appreciation. From the perspective of Spiritual Libra judgment and marriage are related. Both imply the recognition of two equal and divergent forces: good/evil, positive/negative; healthy/unhealthy, whole/fragmented, masculine/feminine, right/wrong, me/you. Above all Libra loves harmony. This love of harmony is like the beam that unites the two pans of the Scales. Love of harmony creates the capacity to see wholeness in opposites. When conflicting energy cannot be unified, Libra seeks harmony through fairness. To illustrate Spiritual Libra's desire for fairness and equilibrium, Zain reminds us of the story of one of the most famous trials in history. “One of the most important qualities of the human mind is the ability to weigh evidence and from a comparison of diverse factors to pass sound judgment. Every day of our lives we are called upon to make minor decisions, if of no greater importance than the amount and kind of food to be eaten, and on rare occasions to pass judgment which affects the fate of human lives. “…one man above all others stands out as the symbol of unusual wisdom. As wise as Solomon, has come to express the very essence of discrimination; and while this Jewish king exhibited the keenness of his mind on many another occasion, it was a certain decision he rendered which first proclaimed that the wisdom of God was in him. It related to two contending women who stood before him for judgment. “Without doubt this is the most famous trial in the whole of human history. “To understand its celestial significance it must be recalled that the sign of the harvest, Virgo, pictures an unmarried woman, and that she stands in the sky immediately before the Scales where judgment must be passed. Where the Sun passes from Virgo into the sign of the Scales, as previously indicated, is where the wheat is separated from the chaff and the value of the harvest ascertained. “Thus were there brought before Solomon two unmarried women, each of whom, nevertheless, had a child. Yet as in threshing there is both sound wheat and worthless chaff, so was the harvest, or child, of one woman alive, and the child of the other woman dead. “According to the story related to Solomon, the two women lived together in one house which certainly must have been the case if both were phases of Virgo—and a child was born to each, the difference in the children’s ages being but a matter of three days. Through the carelessness of one woman, the life of her child was crushed out in the darkness. This also is significant; for it is at this point that the Sun each year dies through the increasing weight of night. “One woman claimed it was the other woman’s child who died, and that the other woman arose at midnight and finding her child dead, had stealthily removed the living child from the first woman’s bosom, and replaced it with the child that had died. But when the light came in the morning, the woman who had remained asleep, finding the child in her arms dead, also perceived that it was not her own, but the child of her companion in the house. “This story and this accusation the other woman stoutly denied; and both women loudly proclaimed the living harvest as her own. Thus stood they, before King Solomon, each disputing the right of the other to the infant. “Summer and winter are divided, one from the other, not only at Libra, but also at Aries; an invisible line, called a colure, cutting the sky between the Vernal Equinox and the Equinox of Fall. The first of Aries marks the place where days and nights are equal in the spring, and the Scales marks where they are equal in the fall. And the sword held in the hand of Perseus has its tip almost on the line right across the sky from the judgment seat. “This militant sword of Aries often is used as the symbol of cutting asunder of the celestial circle in spring, just as the cross as frequently is used to signify the waning strength of the Sun in fall; and, after all, even as summer and winter are but inversions of the relation of night to day, so also in its form does a sword present the inversion of a cross. “Solomon, therefore, called for a sword to be brought to him and commanded, after the manner in which the equinoctial colure divides the zodiac at the point marked by the Scales, that the living child should be divided in two, one half to be given to one woman and the other half to the other. “When she had said this, Solomon at once perceived that she was the real mother of the child, and the child was not slain, but awarded to her. “Libra is the home sign of Venus, the planet of love; and in his wisdom, Solomon weighed the love of the women who came before him, and, convinced that love seeks to preserve the object of its affection and not destroy, passed judgment accordingly. A life was not sacrificed, but delivered to its rightful owner. “It was this same doctrine that love lies at the foundation of life, here and hereafter, and that the harvest of years must eventually be judged on the basis of kindness and compassion, that in later days was set forth by the Nazarene as the commandment to his followers to love one another. “Turning now from the teaching in reference to judgment, it should be noted that in the marriage of summer and winter the forces are not exactly equal; for each year there are seven more days of preponderating light than of preponderating darkness. Evil certainly is present in the world, but if the celestial correspondence holds true, it is not of equal strength with the good. Like summer and winter, they may be closely balanced in power, but if we could look close enough we should find that in the long run the good has a little advantage, and that consequently the world does make spiritual progress. “And followed far enough, this doctrine set forth in the starry symbolism of the Scales, where the Sun may be found each year from September 23 to October 23, reveals the use of evil, as well as signifying the paramount importance of love in human life. The companion Spiritual Libra exercise by Christopher Gibson can be accessed by clicking on the image below or here.